EVA #6 was by far the most exhausting of our first 7 sols, but it was definitely worth it (more details in the EVA report). Our excursion into our little “Noctis Labyrinthus”, which we named “Boilermaker Canyon”, brought us into a quite different geological setting than the Morrison formation around the hab. The region is deeply eroded by Muddy creek and its seasonal tributaries, and forms deep canyons and high-walled mesas. The lowest strata belong to the Entrada Sandstone, dating to the middle Jurassic (180-159 million years ago). The location was slightly further away from the Sundance Sea, therefore it is characterized by an impressive sequence of thin layers of sandstone, at times interrupted by mudstone collars. Green colored layers are indicative of wet conditions that occurred in swampy, stagnant environment (reducing environment). The predominant feature that distinguishes this formation to the far Northeast of the habitat is the presence of layers of finely grained salts, indicators of a shift from wet to dry conditions, in which shallow water produced evaporites. In addition, the whole thickness of the formation is crossed by a large number of clastic dikes, most of which constituted by evaporites. The EVA crew collected samples of the salts and the sandstone both on the way down and at the bottom of the canyon. 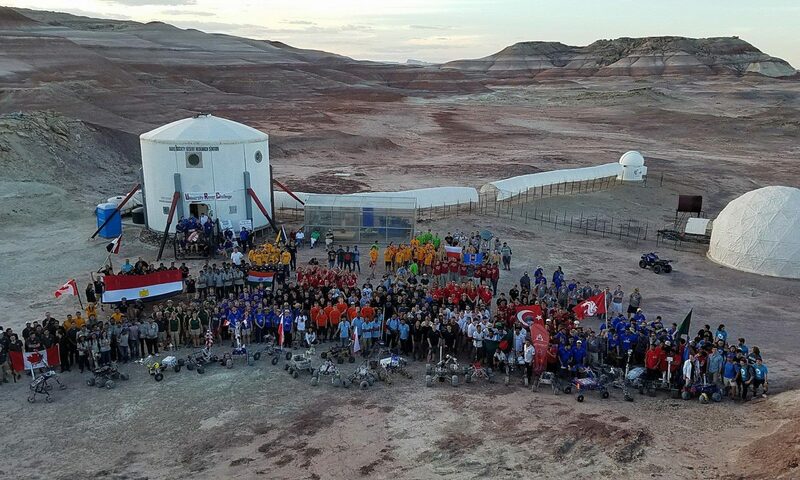 Though the route is rough, I hope many geologists will take advantage of the opportunity to study this breathtaking region, which was to date unexplored by any MDRS crew. 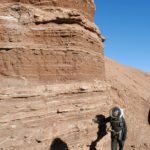 Purpose of EVA: Photography and sampling of the previously identified stratified cut in the canyon wall east of the Maxwell Montes region. Destination: The canyons just to the east of the Maxwell Montes region. Narrative: We departed the Hab at 10:45 and arrived at the end of Cactus Rd. at 11:15. The initial descent into the canyon was steep but navigable, and we descended 200 ft east down a ridge line and stream bed before we encountered a cliff in the stream bed that we could not safely descend. 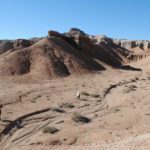 Instead, we turned north west to follow an offshoot of the canyon in the general direction we wanted to go, then climbed up onto a dirt embankment that lay beneath the Muddy Creek canyon’s west edge. This embankment allowed us to travel a 0.5 miles north with no obstruction, but ended at the edge of a smaller canyon on the west of the Muddy Creek, still 0.5 miles south of our target. As we now had only 45 minutes left until our turn around time, we elected to descend into this canyon (which we named Boilermaker canyon) and sample the stratified layers on its north shelf. Returning to the rovers was more difficult as we realized that the final slope we had descended into Boilermaker Canyon from the embankment was too steep to safely climb up again without scrambling. In hindsight, this was a mistake, as it made us completely dependent on our gps for safe navigation. The original intent had been to exactly retrace the same route into and out of the canyon so we could follow our footprints back to the rovers in the event that we lost our GPS. Instead, in order to avoid scrambling back up the south slope of Boilermaker Canyon, we turned down slope to the east and walked towards the Muddy Creek to find a more shallow slope back up to the west embankment that would allow us to rejoin our path. We eventually found a route up a ridge and back onto the embankment, but without the gps, this would have been nearly impossible. Our footprints on the embankment were invisible until we were right on top of them, and had we not had the gps to tell us where our track was, we could have easily gotten turned around in the maze of stream beds and side canyons. During the walk back, we made several wrong turns when we lost our foot prints. Because we had the gps, the wrong turns were noted and corrected within seconds, but had we not had the gps, walk back would have taken much longer, producing a late return. This was not a navigation mode that I would consider sufficiently safe for EVA operations, and I do not intend to repeat it in the future. We will no longer venture into terrain where a safe exit would be impossible without digital assistance, and we intend to carry at least one gps in the future to guard against the risk of failure. We returned to the rovers at 3:00 and made use of the reserve water supplies through a camelback to avoid doffing the suits. The water had been reserved for this purpose, as a Mars suit would be expected to allow the occupant to drink, so we did not consider this a breach of sim. We returned to the Hab at 3:25. Notes on comms issue: One of the radios indicated a low battery on the outbound trip. We elected to continue as communications were still possible, but turned the radio off between transmissions to maximize its lifetime. We also implemented the practice of the incommunicado crew member remaining close to another crew member who could signal via hand that they were needed on comm, or relay instructions via simulated helmet contact. The radio lasted until we reached the site, but then could not be used at all. We swapped radios and kept the crew member with the dead radio in the 2nd place of a single file line, ensuring they could not become separated. As this is now the second time as apparently fully charged radio battery has failed on EVA, we are implementing a new EVA policy where two spare radios will be carried with the EVA team at all times, and swapped in in the event of radio failure. General notes and comments: Our Journalist and Navigation Officer, Justin, did a wonderful job taking over some of the engineering duties for me today! He switched the generator on this morning while I was preparing a hearty oatmeal breakfast for the crew, and he turned it back on again in the evening as I was essentially passing out into a nap following our strenuous EVA! Many thanks to him! The solar power system was run a tad too long and did drop below 60% (to 55%) when the generator was turned back on, which is my fault for not watching it closely enough! My apologies. Boy, does the solar battery SOC deplete rapidly in the late afternoon! Justin also did a fantastic job as HabCom today! HabCom and the crew have been helping me each EVA by recording the beginning and ending rover hours and battery state of charge. Something I have been a little vexed by, however, is the Potable Water Meter. I have been tracking our water usage as the crew attempts to be frugal with water, and I write down the number of gallons indicated on the side of the loft tank each time I fill it, as well as the water meter reading early each morning. According to the loft tank readings, we use around 30-35 G per day, maximum 39 G. Quite to the contrary, the potable water meter says some days that we use about 40 G (not too far off) and some days (like Sol 04 and Sol 06) that we used 50-60 G. I’m really not sure where this discrepancy is coming from, and it makes it really hard to give an accurate number for what is left in the static tank. It’s also hard to give the crew feedback about our water-saving measures. Questions, concerns and requests to Mission Support: Water and propane are both in need of a refill, please! Additionally, I would love some feedback and support on the potable water meter. Today’s clear skies allowed the warm sun to erase any lingering Martian frost and set the stage for our most ambitious EVA yet. The vast canyon surveyed in EVA 3 was but a tantalizing preview of the wonders that lay below. We had to return. A team of 4 led by our commander, Max Fagin, suited up and departed the airlock around 10:30 am, reaching the turn-off to the Maxwell Montes around 11:15. But instead of walking north along the canyon’s ridge as we had done previously, the team searched eastward for a safe passage into the canyon itself. They succeeded and soon found themselves immersed in a sprawling labyrinth of rocky channels. 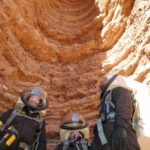 Invigorated by the thrill of discovery, the team pressed on, and after some wandering was able to locate the base of the enormous stratified walls identified in EVA 3. The team’s geologist, Cesare Guariniello, studied the crossbeded layers of sandstone and salt with a trained eye, but the wander through the maze of chasms had cost the team time. Before long it was time to head back. The EVA team returned at 3:30 pm, exhausted, but with smiles on their faces. Nothing exciting is planned for this evening and I’m sure today’s EVA crew will appreciate the downtime. Last night we played our first few trial runs of the self-made cooperative Mars-themed card game which we have named “Mars Quest”. We plan to iterate on the rules slightly, as the game felt a little too easy. But the team still greatly enjoyed the experience. Changes to crops: Radish sprouts are growing quickly. Spinach survived transplanting. Research observations: The microgreens seem to have poor emergence relative to the microgreens in the crop section of the Greenhab. This could be attributed to the better environment in the crop section or the surface sterilization treatment the research seeds received. Narrative: Not much happened today. The plants are slow and take time to grow. The old Green Hab used to have a “Zen Garden” to help crew members relax, but the current crop production system seems to be serving a similar purpose. Justin, the crew journalist, stopped by to enjoy the plants, warm air, and humidity. There is something about being surrounded by green that is reassuring, and the flowers on the crops are especially beautiful because they hold the promise of treasure not yet tasted.